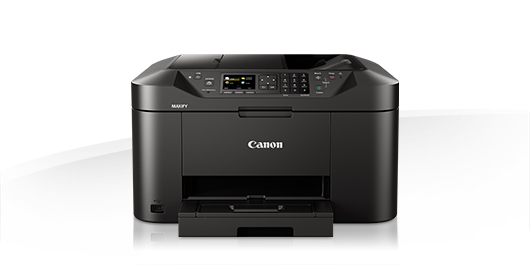 The Canon Maxify MB2150 is a very versatile printer, scanner, copier and fax designed for home offices. It has a 250-sheet feeder and 50-sheet document feeder and produces outstanding results with vivid colours and crisp text. It prints A4 fast in either mono or colour, while its first page out time is just six seconds, and offers great double-sided printing support for a variety of paper sizes and types, including A4 plain paper, labels, envelopes, photo paper and even two-sided ID card copying. The Canon Maxify MB2150 printer is built for productivity and is quick and simple to use. The Canon Maxify MB-2150 is a compact all-in-one printer for home offices and has a wide variety of functions, including printing, copying, scanning, faxing as well as Wi-Fi links. Its maximum print resolution is 600 x 1200dpi, making the images, photos and documents printed of very high quality. As the dimensions of the printer are 463 x 389 x 260mm and it weighs only 10.6kg, it is very easy to move where needed. The Canon Maxify MB2150 offers fast printing at 19ipm mono and 13ipm colour. It has a fantastic Wi-Fi networking feature for direct printing from mobile devices as well as printing from and scan to cloud services. The printer is also very productive and has a 250-sheet capacity and 50-sheet ADF. As the Canon Maxify MB-2150 is not suitable for large amounts of bulk printing, it is only suitable for domestic use. It has also been replaced by a newer, more-advanced model and replacement parts can be a hassle to find if maintenance is needed.